Earth Friendly Orange Plus Heavy Duty Floor Cleaner Concentrate is a highly concentrated (1:128) formula, suitable for cleaning the dirtiest floors. It degreases & deodorizers floors using the power of oranges in a concentrated orange oil based formula. Orange Plus Heavy Duty Floor Cleaner is ideal for cleaning the floors in warehouses, factories, restaurants and other high-use & industrial type settings. 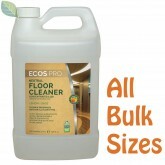 It works exceedingly well in floor scrubbing machines & leaves floors clean, fresh and residue free. 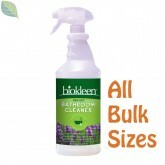 Orange Plus Floor Cleaner is Non-toxic, readily-biodegradable & pH balanced. All ingredients are derived sustainably from plants. Earth Friendly Products Heavy Duty Floor Cleaner is free of synthetic perfumes and dyes, is grey-water and septic safe & is recognized the USDA's Biopreferred Program. CAUTION. While it's very effective at removing scuffs and marks, it can strip certain finished if used highly concentrated. Always, test first. Water 7732-18-5; Cocamidopropylamine Oxide (coconut-based surfactant)	68155-09-9; Caprylyl/Myristyl Glucoside (plant-based surfactant) 110615-47-9; Limonene (orange oil) 94266-47-6; Cocamide DEA (plant-based surfactant) 68603-42-9; Alcohol Denat. (corn-derived solvent) 64-17-5; Phenoxyethanol (Preservative) 122-99-6; Methylisothiazolinone (preservative) 2682-20-4.